This week I was faced with a decision I have been dreading and skillfully avoiding for over a decade now, having my wisdom teeth removed. Something about the dentist, the needles, and parting with something I had spent years growing myself just drove me up the wall. Unlike Peter Pan in our world we all have to grow up sometime and for me it was facing the dentist and allowing them to do their worst. I digress, after all this blog isn’t about facing fears or staying on top of your health so you age as gracefully as possible it’s about wine. I usually turn to Champagne to celebrate the moments in life that make it worth living, this week I turned to Champagne for the comfort of the known and the expected. Every time I pop a cork of my favorite bubbly I know what to expect in the glass unlike going into oral surgery where every possible action could lead down an unknown path. Needless to say everything went fine, it took maybe 20 minutes for my oral surgeon to removal my 4 wisdom teeth and as I type this post I’m recovering remarkably fast. And what got me through those 20 minutes I have been dreading for over a decade? Champagne and the mental debate of what to drink to celebrate my up and coming 26th birthday. Krug? Ruinart? Salon? Cristal? Tune in around July 5th and find out, but for now Gosset. Gosset began in the vi llage of Ay in roughly 1584 when Pierre Gosset started selling still wines. It is important to note that Gosset is often times mistaken as the oldest Champagne house which it is not, it is in fact however the oldest distributor of still wines in the region. The house was impeccably managed by the Gosset family for over 400 years. In 1994 it found itself up for sale, something all Champagne lovers dread. The possibility of a family run and nurtured business rich in history and age-old techniques being bought out by a major corporation and losing its quality and pride. Thankfully this didn’t happen. Gosset was purchased by the Cointreau family though a large corporation one that still prides its self in family traditions. Over seen by Beatrice Cointreau she has managed to breath new life into the vineyard while still maintaining the excellence we all expect. Medium Body 12 % Alc By Vol. 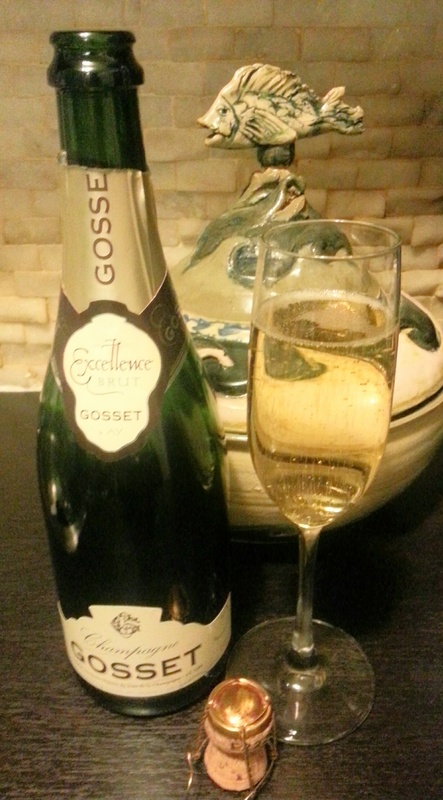 Excellence is Gosset’s first level of its Champagnes. Although it is its cheapest by market value its a great way to get a foot in the door. Id say it’s an amazing steal at roughly $36 a bottle and at its quality. The nose starts off with scents of baked green apple, caramel, vanilla, and even notes of caramelized lemon segments. Although yeast is usually apparent on the nose and palate Excellence only gives transparent hints of it. This Champagne has an amazingly round acidity and body making it easy drinking. With your eyes closed you may think your actually biting into a caramel covered green apple. Small hints of Bosc pear, lemon rind and brioche tickle on the tongue. A small hint of cheese rind lingers as this amazing champagne finishes off. This Champagne demonstrates extreme diversity when pairing, great as an aperitif or with tuna tartar, sushi, oysters, or dishes finished with mushroom sauces. Dessert I think anything Chocolate.